‘Primitives’ is a performance based opti-sonic installation. A DVD of short films, 12” vinyl of audio interpretations, source code and executable software were released by the excellent Broken20 imprint in 2014. The microsite is now the primary online home. The remainder of this page is aimed at curators/producers. 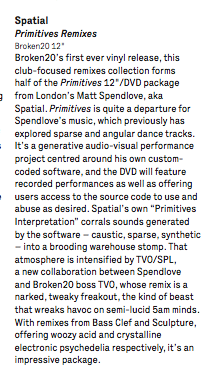 ‘Primitives’ uses custom made, home coded software to explore sonic and optical intensity articulated by simple geometric figures and extreme frequencies. Projected images drive a sensory assault, consumed by your eyes, then ears and existing somewhere between perceptions. This is Spatial’s latest project interrogating hacked code for excruciating light. Read early reviews of the 12" component from Wire magazine & Resident Advisor. For SHAPE related projects email Neja (mota.museum@gmail.com), all other enquiries to: comms@infrasonics.net.